After enjoying a bath in a walk-in tub, we can’t just open the tub door. These safety tubs are special; a senior has to wait for the walk-in bathtub to drain. How fast does a walk-in tub drain? It can take up to more than 10 minutes for all the water to go out of the tub. The fastest draining walk-in tubs, however, can be completely emptied in under 120 seconds. The capacity of the walk-in tub. Water pressure in your pipes. The width of your water pipes (3/4 inch pipes are preferable to 1/2 inch ones). Normal piping and a standard walk-in tub capacity of 60 gallons should drain the bathtub in about 5-10 minutes. Depending on how quickly does the walk-in bathtub empty (or in other words – how long you have to wait in the safe step tub to be able to open the bathtub door), we can put accessible tubs in 4 categories. Later on, we’ll give you 3 examples of the fastest draining tubs (under 2 minutes). Super Fast Draining – 1-2 minutes. Bathtub comes with 2 draining holes/pipes and possibly a drain pump system. Fast Draining – 2-6 minutes. Has 2 draining pipes but no drain pump system. Usually smaller tubs below with 50-gallon capacity or less. Average Draining time – 6-10 minutes. Only has 2 two inch draining pipe. This is the standard draining time of walk-in tubs. Slow Draining – 10-15 minutes. 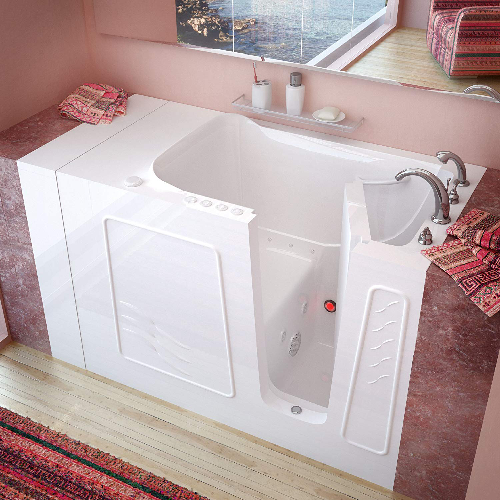 Only for very large walk-in tubs like the barometric tub and if you have low water pressure in the piping. These estimates of how much time it takes for a tub to empty are exactly that: estimates. Every walk-in tub has it’s own particular drainage time that is usually specified in its description. If you would like for a walk-in bathtub to have a fast draining system, look for the ones with 2 draining pipes and a full drain pump system. We’ve found 3 examples of the fastest draining tubs in order for you to have a look at the main features that enable them such record drainage times. #1 American Standard 30″ x 52″ Tub – 2 Drains and Quick Drain TechnologyAmerican Standard has developed a patented Quick Drain technology that enables super fast drainage of their bathtubs. This American Standard walk-in tub will drain in less than 2 minutes. Thanks to the QUICK DRAIN patented technology, American Standard tubs have a bit on an edge when it comes to how quickly their walk-in tubs are drained. The Royal Tub by Ella is one of the classic walk-in tubs that excels with record-breaking drainage times. Some Ella tubs like this one can empty in less than 90 seconds (with perfect piping). Ella tubs have, in general, one of the most recognizable designs of walk-in tubs. #3 MediTub MT3053RWD Standard Fit – Empties In Less Than 60 Seconds? MediTub’s great advantage is their Auto Drain technology that promises to drain a walk-in tub in less than 60 seconds. MediTub Standard Fit bathtub with Auto Drain technology.